Photo: Courtesy of ASOS ASOS Nose Or Ear Jewel Cuff, $8.49, available at ASOS. One of the draws of a septum piercing is the ability to turn up your retainer in situations where you don't want your boss/grandparent/recruiter giving you the hairy eyeball. But, we've found a mass resin of a septum ring that's as plain as the…well, nose on your face. Beginning with Givenchy's massive, mouth-covering faux ring — that appeared on both its men's and women's runways — the silver-dollar-sized septum piercing was something we always associated with high-fashion wackadoodery (much like McQueen's armadillo heel or Marc Jacobs' pantsless fall season). However, this seems to have trickled on down to us plebeians. ASOS is selling a spiked (pierce-less) cuff for under $10 that you can technically wear anywhere, but they chose to model it on the septum. Though we don't recognize this piece of jewelry for any event that involves ingesting foods and liquids or verbally communicating, this is definitely the most "statement" piece of statement jewelry we've ever seen. And seeing as though the only thing you could communicate while one of those things is in is probably just "mmrphhhh," the whole thing is delightfully ironic. 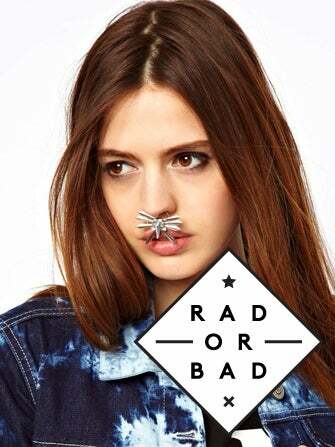 Rad or bad, folks — when is a doorknocker septum ring a good idea?